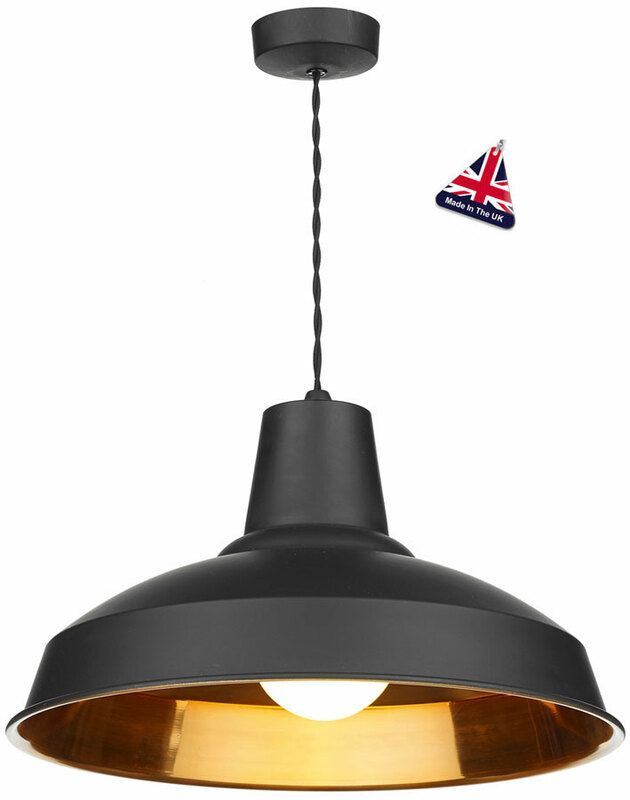 This David Hunt Lighting Reclamation 1 light ceiling pendant in matt black with copper inner features industrial style and is handmade in Britain. A vintage style ceiling light, with wide matt black finish shade, matching ceiling mount and old fashioned braided cable. The shade inner is in a copper effect to reflect a warm light and add contrast. The matt black contrasts beautifully with the copper effect inner to give it an up to date look and feel. A stylish fitting to add the finishing touch to any interior style and well suited to installation over a dining table, in a living room, hallway, bedroom or landing. Fantastic installed singly, in a row or in multiples over a table, kitchen island or worktop. Other products in the David Hunt Reclamation industrial style lighting range can be viewed below and include a range of pastel colours and copper or chrome effect lined shades. Bespoke finishes are available on request. Please contact us for further details. The Reclamation lighting range is designed and handmade in Britain by David Hunt Lighting who are well known for the design and manufacture of original hand crafted products such as the Reclamation 1 light ceiling pendant in matt black with copper inner you see here.